Oxford, MS —Oxford Film Festival is proud to announce the world premiere of Crude Independence, a documentary feature film from first-time director Noah Hutton and producer Sam Howard and Jonathan Demme. Crude Independence will premiere on Saturday, Feb. 7 at 2p.m. in the Oxford Malco Studio. The Oxford Film Festival introduces the lineup of films selected to screen in the sixth annual festival. In addition to the eight competition categories, the festival will present several special screenings. The 2009 Oxford Film Festival runs Thursday, February 5 to Sunday, February 8, 2009 in Oxford, MS at the Malco Studios. Crude Independence is a documentary film about the heartland in the process of transplanting itself, and the new heart is pumping oil. In 2006, the United States Geological Survey estimated there to be more than 200 billion barrels of crude oil resting in a previously unreachable formation beneath western North Dakota. With the advent of new drilling technologies, oil companies from far and wide are descending on small rural towns across America with men and machinery in tow. Director Noah Hutton takes us to the town of Stanley (population 1300), sitting atop the largest oil discovery in the history of the North American continent, and captures the change wrought by the unprecedented boom. Through revealing interviews and breathtaking imagery of the northern plains, Crude Independence is a rumination on the future of small town America—a tale of change at the hands of the global energy market and America’s unyielding thirst for oil. “We are thrilled to have a film of this caliber, both in its message and its cinematography, premiere at our festival. We are confident that it will have a successful run on the independent festival circuit,” co-director Michelle Emanuel said. NOAH HUTTON, Director. At age 21, Crude Independence marks Noah Hutton’s directorial debut. 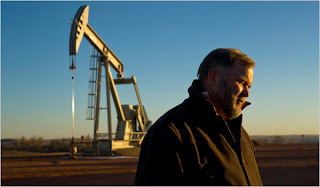 Hutton first learned of the oil boom in North Dakota from a New York Times article published in January of 2008. After putting together a proposal and raising funds all spring, he set off along with his producer and stepbrother, Sam Howard, and co-producer, Sara Kendall, to spend the summer filming Crude Independence in the small town of Stanley, North Dakota. Born in Los Angeles to actors Timothy Hutton and Debra Winger, Noah spent his childhood on and around film sets and developed a passion for filmmaking of his own at an early age. Before directing Crude Independence, Noah directed the narrative 16 mm short Knives produced by the Wesleyan Film Cooperative. SAM HOWARD, Producer. Born in Northridge, California in April of 1987, Howard grew up with his mother, talent agent Karen Sellars, in Santa Monica, California. As a youth, Howard traveled with father and actor Arliss Howard, spending time on and off sets where he developed an unshakable interest in the behind-the-scenes aspects of filmmaking. In 2005, Howard traveled to Calgary to act in the Revolution Studios film, Dawn Anna, furthering his interest in roles behind the camera. Having worked with a number of students at the Tisch School of Film, Howard entered the producing program at Tisch, and plans to graduate Stern in spring of 2009 with a BS in Marketing. Crude Independence is the first feature documentary that Howard has worked on as producer. The entire 2009 Oxford Film Festival program is now available on the oxfordfilmfest.com Web site. For more information on Crude Independence, please visit http://www.crudeindependence.com. The 2009 Oxford Film Festival Sponsors help sustain not only the Festival but also the year-round programs of the non-profit festival. Their support is crucial to the mission of celebrating independent film. This year's Festival Sponsors include: Presenting Sponsors – Oxford Convention and Visitors Bureau; Patron Level – Malco’s Oxford Studio Cinema, The University of Mississippi, Yoknapatawpha Arts Council; Festival Level – R & B Feder Charitable Foundation for the Beaux Arts, Media Production, The University of Mississippi, Mississippi Film Office, New Colony Homes, Donna Ruth Roberts and more. Founded in 2003 as a project of the Yoknapatawpha Arts Council, the Oxford Film Festival is an independent non-profit 501c3 organization committed to celebrating the art of independent cinema. The Oxford Film Festival entertains and educates its participants, providing residents and visitors with the opportunity to watch independent films as well as to meet the filmmakers and learn from industry professionals. The variety of films and panels attracts fi lmgoers of all ages and backgrounds.